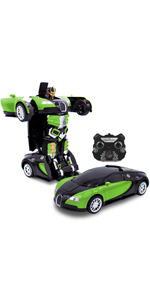 Save the galaxy from evil with your very own RC Toy remote control Transforming Robot Warrior! 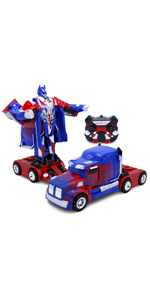 Race to the fight in vehicle mode and spin 360 degrees to face your enemies no matter where they are, then with the push of a button you can transform from Sports Car to Robot mode. Equip the included sword and shield accessories and your Remote Control Transforming Robot Warrior is ready for battle. With a 27 Mhz remote control and a 100’ range, you can take the fight to the bad guys wherever they may be lurking. Once you’ve defeated the forces of darkness, celebrate by activating Dance Mode, complete with flashing xenon lights, dynamic music and multiple dance moves!